You don’t have to break your budget to keep your clients and prospects thinking warm thoughts about your brand this winter! At Myron, we have wonderful winter promotional products that will be a perfect gift for your wallet and for your recipients. This sweet ornament is plush and comes in your choice of a snowman or Santa Claus design. Your imprint has a prominent place on the back pocket, which perfectly fits either a business card, a small note, or a gift card. Your leads will look fondly on this ornament year after year! Available in subtle holiday-themed colors, the Royale Tech Triple Function Pen is a multipurpose flashlight, ballpoint and stylus pen that your recipients will make use of all year long. Your brand is laser-engraved on the cap for long-lasting quality. Your imprint is the only thing you need to add to this bag to make it the perfect giveaway! While your clients and leads toast to the holidays and ring in the New Year, they’ll be toting your brand with them from celebration to celebration. Stay warm and connected with touch screen gloves that sport your full-color imprint on both hands. 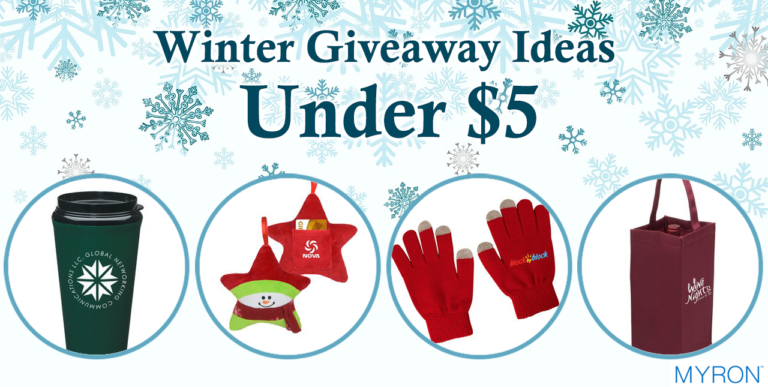 Practical and cozy, these gloves are a classic winter giveaway made with modern needs in mind. Tumblers are one of the most popular promotional products and for good reason! The Evolve Infinity Tumbler is perfect for hot or cold drinks, fits conveniently in most car cup holders, and is a cost-effective canvas for your branding. Your clients and prospects will have your brand to thank when they enjoy their favorite winter beverage on the go. Thanks to our extensive catalog, Myron has the high quality promotional giveaways that fit your brand and budget.